Category Thoughts From Fit Paleo Mom and tagged paleo, sweet potato hash. Today is whole30 day 10. I have to say that I felt really hungry today. I don't know if it's that I was home all afternoon, or what, but it put me in a rather bad mood. Today I had coffee with coconut milk, eggs, and half an avocado for breakfast, I made a salad for lunch with my left over baked chicken from last night. I put some warm dates in my salad today and it really made it extra good. This afternoon I had a smoothie made with strawberries, blueberries, coconut milk, and almond butter, and also some almonds. I found this recipe for sweet potato hash with beef on a Facebook group that I like to look at called post your paleo. People just post paleo meals that they make. When I saw this one I thought it looked really good, so I had to try it. It was very good! Start by sautéing the garlic and onion in the coconut oil. Next add the chopped bacon. Once the bacon starts to brown add the ground beef. Once the meat is browned add your sweet potatoes. Turn to medium heat and let cook until sweet potatoes are soft. Finally add spinach and let cook for a few minutes. Don't let the spinach cook for too long because it will get rubbery.Season throughout cooking with salt, pepper, and paprika. 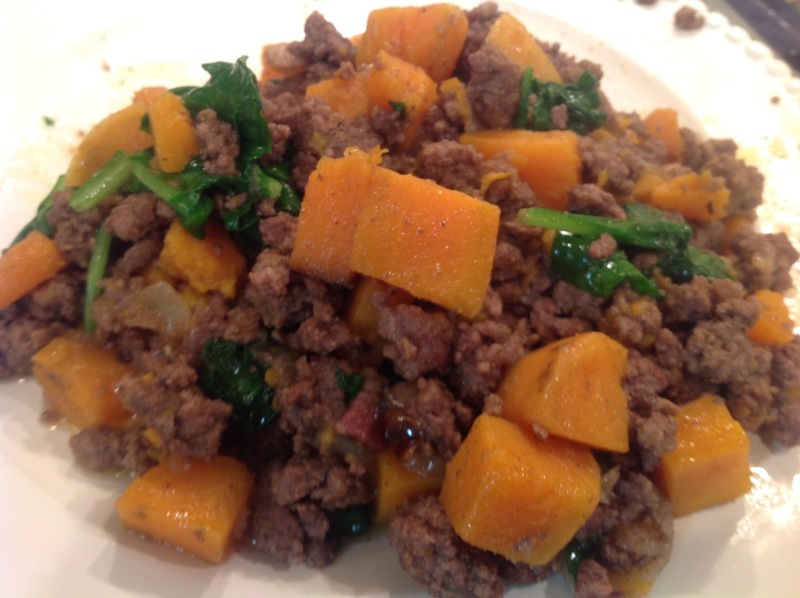 This entry was posted in Thoughts From Fit Paleo Mom and tagged paleo, sweet potato hash. Bookmark the permalink.